Cold Eyes is a snappy, playful surveillance thriller that entertains without leaving much of a lasting impact. Co-directors Cho Ui-seok and Kim Byung-seo do a bang-up job on the technical side of things, expertly executing the carefully orchestrated heist opening the film. 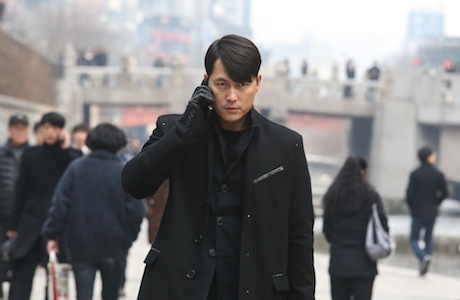 Amidst all the calculated, city-spanning chaos, the filmmakers display a keen attention to the minutiae of shot composition — the shaky first-person camera following a group of thugs robbing a bank gives way to steady, composed cinematography when switched to the omniscient perspective of the operation's brutally efficient, shadowy mastermind (Jung Woo-sung). Our protagonist, Ha Yoon-ju (Han Hyo-joo), receives a far subtler, but no less intricate introduction. Establishing character ticks and the cinematic language of extraordinary observational abilities that will be used throughout the film, we meet the newest member of the Seoul police's special surveillance unit during her final field test. No sooner has she been inducted into the idiosyncratic tribe of elite Big Brothering than she's thrust into the investigation of the opening heist. Tapping into the passé gee-wizardry of CCTV tracking and mixing it with good old fashioned, put-on-a-funny-hat-and-follow-the-suspect foot reconnaissance, Cold Eyes never wavers in its efforts to amuse and stimulate through slightly quirky, broad humour and elaborately plotted games of cat-and-mouse, though it fails to establish any kind of emotional connection to any of its characters — gimmicky eccentricities substitute for meaningful personality traits. While it ends up neglecting its central tenet — the positioning of uncanny human observation and recollection as superior investigative agents to the dispassionate eye of recorded video footage — for much of the film, the concept does come full circle in a feat of exceedingly clever scripting forethought. A little pudgy around the second act, prone to tawdry theatrics — there are more spinning camera shots than in Marvel's The Avengers — and as thematically lightweight as it may be, this captivating South Korean police thriller is among the better examples in a highly overcrowded genre.